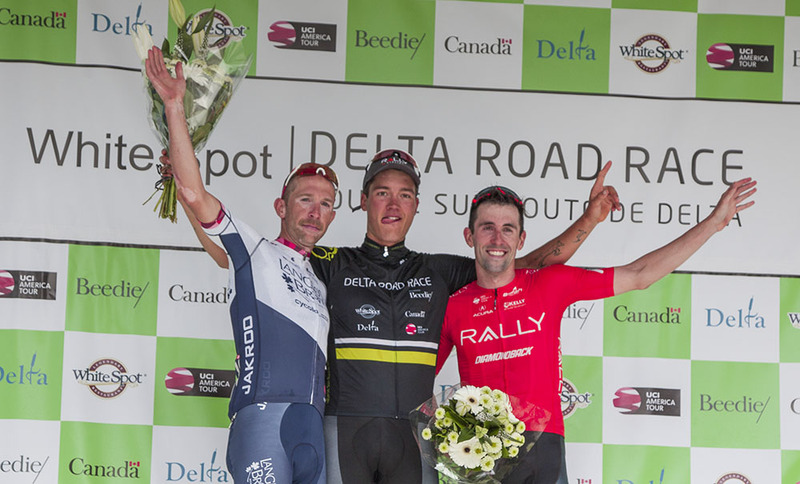 Local Victoria rider Adam de Vos (Rally Cycling) crossed the finish line solo on Sunday to win the 155 kilometre UCI sanctioned Tour de Delta presented by Beedie White Spot | Delta Road Race. As he finished, he pointed at a tattoo on his wrist of a fox chasing a rabbit. The symbolism has a special meaning to him. "It's a new fox tattoo, it's part of my heritage and it's what my last name means in English," de Vos explained. "I had a breakaway in Malaysia that I won a stage on and they called me 'Sneaky Fox', so that's what it is." The last half of Sunday's race saw several attacks and breaks, but it was de Vos and his Rally Cycling teammates near the front each time, despite the chase group being loaded with speedsters like Germany's Florenz Knauer (Hermann Radteam), the third place finisher in the Saturday night Ladner Crit. "Florenz - I raced with him on H&R Block actually - he is incredibly quick. In a group of eight when you have the numbers, you can't just go with one in four odds, you must make it better for yourself so that's what we were trying to do," said de Vos. "My teammate Nigel Ellsay was in a good group there, causing the riders in my group to do a lot of work, so I was in a good spot and we just wanted to reshuffle. I think the chaos was good for us and we took advantage." Second place finisher Kaler Marshall was guest rider for the local Vancouver Langlois Brown team. The 32-year-old went up the road with de Vos to leave the chase group behind on the last lap, knowing that the heat would be cranked up. "The last couple laps got really hot, Rally was kind of going 1-2; sending guys up and then coming into the final half-lap through the start/finish, de Vos just started to roll off the front and I thought, 'This is a wheel to go with' and that last lap hurt a lot. I just stuck on his wheel as long as possible and helped when I could and hoped we could go 1-2," Marshall said. 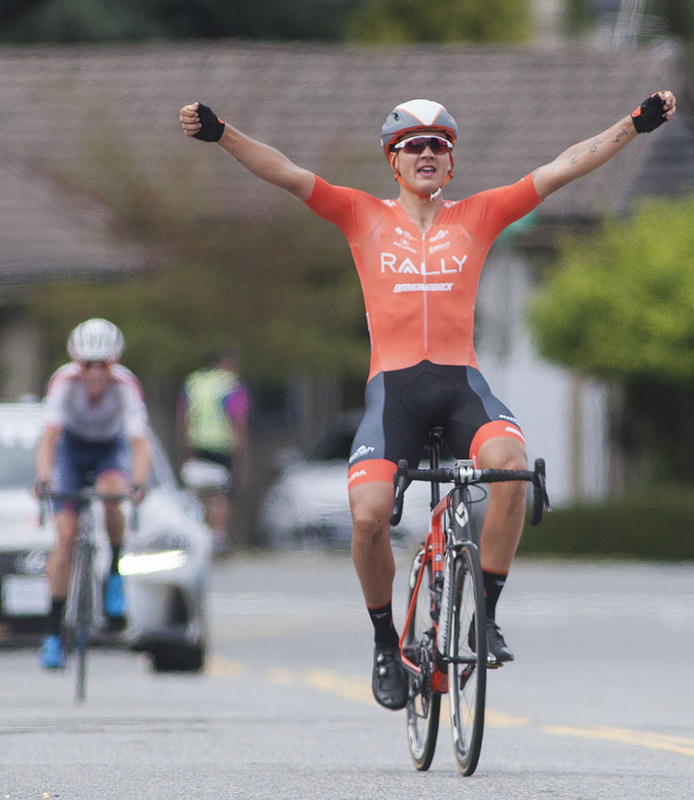 Rally Cycling took third spot as well, with Eric Young making his third straight appearance on the podium at the Tour de Delta after the 29-year-old won Saturday's Ladner Criterium and Friday's North Delta Criterium. The team now has six podium appearances through three races to open BC Superweek. 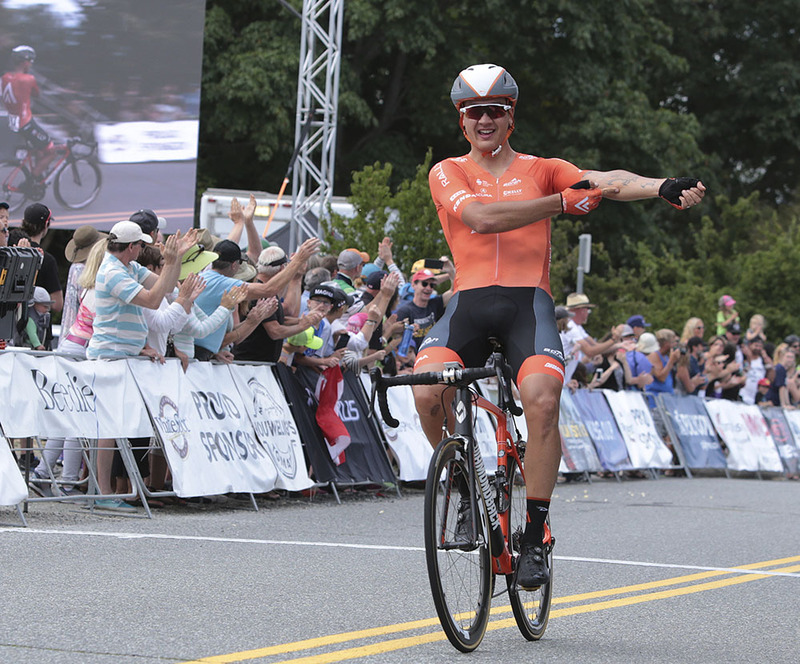 De Vos is the first Canadian to win a race at BC Superweek this year and claiming victory on home turf means a lot. "It's the first UCI race that I've raced at where I've slept in my own bed, so it's pretty cool to win here. I grew up in Victoria, raced in the Lower Mainland with Trek Red Truck and H&R Block for a number of years, my aunt and uncle used to live on the course in Tsawwassen, so it's a cool race to win for me." 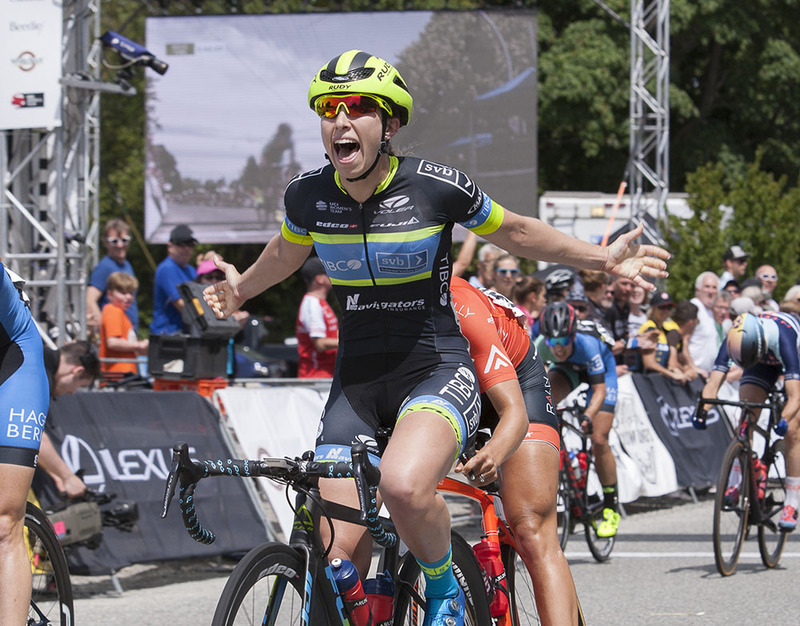 The women's 104 kilometre race saw American Kendall Ryan (Team TIBCO-Silicon Valley Bank) finish first for the third straight day at the Tour de Delta and BC Superweek. 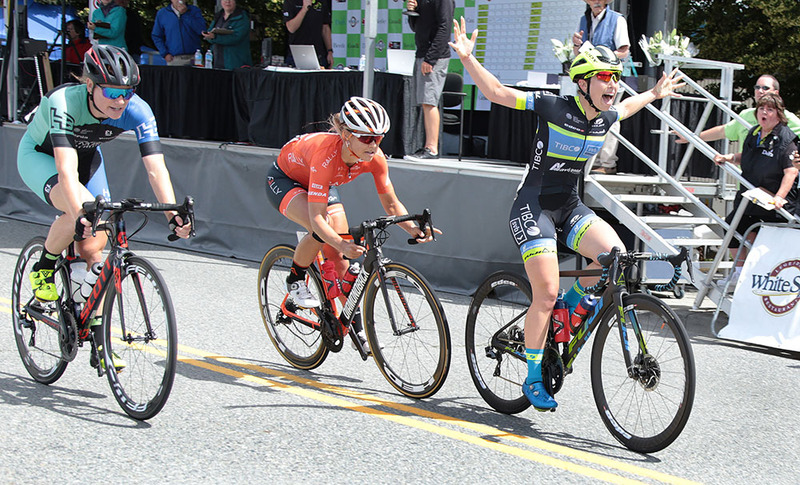 The three-time US national champion also won the Ladner Criterium on Saturday and the North Delta Criterium on Friday to kick off the series. Ryan joins Joelle Numainville as one of only two women to win all three races in Delta in the same year. She's also back-to-back champion at the White Spot | Delta Road Race after winning it in 2017. This year, it was a great lead out by Ryan's teammates on the final lap that set up her specialty - the sprint. "My teammates absolutely gutted themselves in that lead out. They were relentless today on every attack and just made sure I was able to sit in and save everything for the finish," explained the 25-year-old from Camarillo, California, who nets nearly $3,400 for the win. "I tried to do the same line I took last year, I think I went a little bit early, but I was still taking the fastest line. I saw Lily Williams coming up on my right and just had to hit it again, so I was happy to hold on to it and take the win a second time." Williams, who is riding for the Hagens Berman - Spearmint, finished second in the bunch sprint. 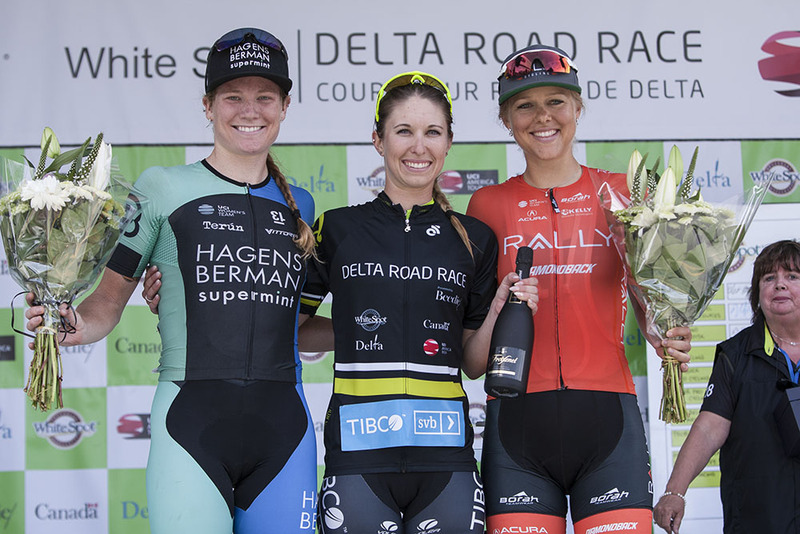 Rally Cycling's Kirsti Lay was second in Saturday's Ladner Criterium and third in Sunday's White Spot | Delta Road Race. As the race developed, it became clear to the Calgary native that it would end in a bunch sprint. "People started putting in a few digs to see what could stick and it was pretty clear that nothing was going to hold. Even though people were trying, we were rushing right on the back and TIBCO was setting up the sprint for Kendall, we knew that. We were just trying to play off that and see how it went," said Lay. "There was lots of traffic out there, it's a long, long draggy sprint to the finish so you have to be patient; we came third today, it was a good race, but we're still going for that win." Despite the third-place finish, the UCI points gained are huge for Canadian cyclists like Lay, who won a bronze medal at the 2016 Summer Olympics in Rio. "It's huge to have a UCI race in Canada. It's amazing, we love coming here and it's such a fun race, especially because everyone comes out of their houses and cheers for us. It's just a great atmosphere of racing." With the field knowing TIBCO would likely try and set up Ryan for the sprint finish, Lay adds that they'll continue to try and counter the strategy as BC Superweek rolls on. "Kendall's a great sprinter and she's very smart, so we've got to play off that and eventually I think we can get it," said Lay. "The New West Grand Prix has a kicker in it so it's not totally straightforward, you have to be able to climb a bit, so maybe we can use that to our advantage." TIBCO's tactics through three days at BC Superweek are no secret to the other riders now, and it's something Ryan is aware of. "We're here all week and going for some more wins, hopefully mix it up - I'm not giving anything away!" she laughed. BC Superweek continues Tuesday with the New West Grand Prix. 30 Emily Flynn (Can) Canadian National Team all s.t. 51 Margot Clyne (USA) Twenty20 p/b SHO - AIR all s.t. 57 Krista Matthews (Can) Glotman Simpson Cycling all s.t. 60 Annie Forman-Mackey (Can) Canadian National Team both s.t. 63 Stephanie Wood (USA) LA Sweat s.t. 53 Brendan Rhim (USA) Holowesko Citadel Presented by Arapahoe Resources all s.t. 74 Tristan Guillemette (Can) Canadian National Team / Race Clean all s.t. 77 Alexis Cartier (Can) H&R Block Pro Cycling s.t. 80 Adam Jamieson (Can) Silber Pro Cycling both s.t.